A crisp sweet shell holds a chewy layer of caramelized, honey-sweetened peanuts, topped with a smooth creamy peanut butter filling and finally crowned with a ganache glaze. This tart keeps very well. NOTE: the tart is in the lower right of the picture. The three items were part of an all-peanut butter dessert article, for which I truly enjoyed recipe testing! The cake upper right is Chocolate Cake with Milk Chocolate Peanut Butter Frosting and Peanut Butter Brittle. 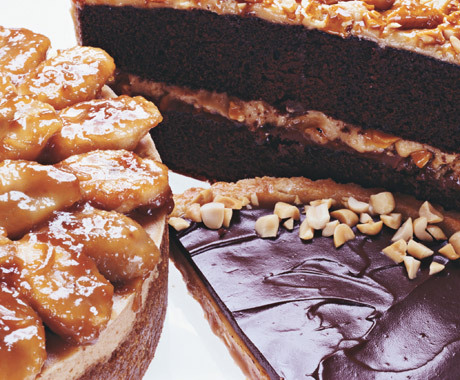 The cheesecake lower left is Peanut Butter Cheesecake with Caramelized Banana Topping. Coat a 10-inch loose-bottomed fluted tart pan with nonstick spray; set aside. Beat butter with electric mixer until creamy, about 1 minute. Add sugar gradually and continue to beat, about 2 minutes, until lightened and creamy. Beat in the egg yolk until well combined. Add flour and pulse the mixer on and off until it begins to combine, then run mixer just until dough begins to form. Scrape out onto plastic wrap and use wrap to help press into a flat disc shape. Wrap the dough thoroughly. Refrigerate for at least 2 hours or overnight. Roll out on lightly floured surface to a 13-inch round and fit into pan, pressing into corners and trimming top. Freeze for 15 minutes while oven preheats. Position rack in middle of oven. Preheat oven to 350 degrees F. Bake tart directly on oven rack for about 12 to 15 minutes or just until it feels dry to the touch and is beginning to color around edges. Check about halfway through baking; if crust is puffing up, gently press back down with back of a fork. Cool on rack while you make Nut Filling. Turn oven up to 375 degrees F.
Melt butter in a medium sized saucepan over medium heat. Add brown sugar and salt, stirring to blend. Add cream and honey. Bring to a boil, turn down heat and simmer for 1 minute. Quickly stir in nuts and pour into tart shell. Bake for about 12 to 15 minutes or until filling is bubbling all over and golden brown. Cool completely on wire rack. Meanwhile, make Peanut Butter Filling. For the Peanut Butter Filling: Beat all ingredients together with electric mixer, beginning on low speed. Once combined, beat well on higher speed until very smooth, scraping down the bowl once or twice. Spread filling over cooled and firm nut layer using an offset spatula. Place in refrigerator while making ganache. For the Ganache Topping: Melt chocolate and cream together in top of double boiler or microwave; stir until smooth. Cool slightly. While still fluid, pour on top of chilled peanut butter filling and spread into even layer using a small offset spatula. Sprinkle chopped peanuts all the way around edge. Refrigerate at least 2 hours before serving. Tart may be refrigerated overnight or up to 4 days. Served cold, it will be chewy like a chilled candy bar. Served at room temperature, the layers soften and it becomes creamier. I like it both ways, perhaps being partial to cold. Tip: Use creamy (smooth) all-natural peanut butter. To make sure you’re buying the right stuff, check the label. There should be only two ingredients: peanuts and salt. This style of peanut butter may have a layer of oil (from the peanuts) on top. If it does, chill the jar for a few hours, then slowly mix until smooth. Don’t use freshly ground peanut butter: It can have inconsistent flavor and texture.